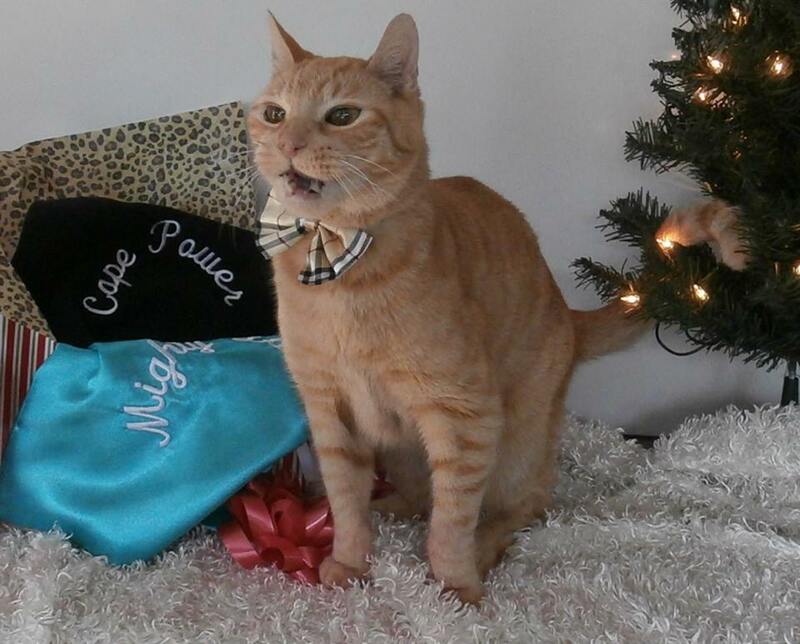 Mighty Lou – Special Needs Ambassador Cat Extraordinaire! Mighty Lou has been helped to overcome his disabilities and now he is an ambassador helping homeless cats in need. 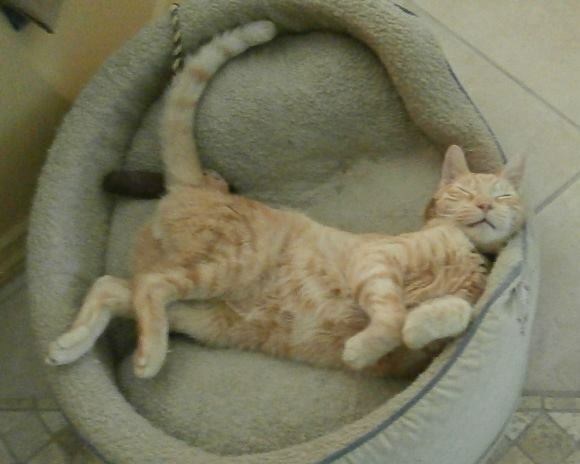 Mighty Lou is “spokescat” for Sarasota, Florida rescue and adoption center Cat Depot’s Friends Like Me program. He dons his superhero cape and travels Florida to promote helping homeless cats and kittens. Mighty Lou is a special needs cat with neuropathy in his hind legs due to diabetes, and he is deaf. 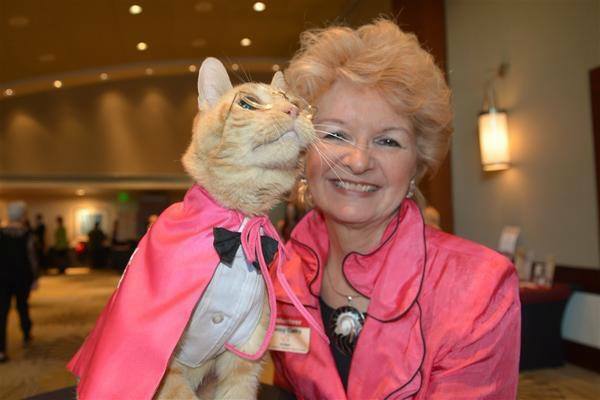 He dons his superhero cape and travels around southwest Florida with his petmom Nancy Colby to promote helping homeless cats and kittens. He is especially proud of his efforts to help cats who have suffered an injury or illness. Though he himself is deaf, Mighty Lou speaks loudly to his cause, and provides inspiration, happiness and laughter to all those who meet him. Mighty Lou is a media sensation, life of the party and a friend to everyone he meets including his animal friends. After watching the video about seen below, you will see that Mighty Lou is also a good sport and loves to be the center of attention. Mighty Lou has his own blog at Cat Depot’s website and his own Mighty Lou Facebook page. A Cat Depot volunteer noticed an orange tabby cat dodging cars in a busy Sarasota intersection. The cat was painfully thin and was dragging his hind legs. The Good Samaritan volunteer figured he had been hit by a car and rushed the distressed feline to Cat Depot. It was first thought that the kitty had been hit by a car, but he didn’t seem to have any pain in his hind quarters. Upon further examination and testing, Cat Depot’s veterinary team discovered that Lou (as the staff had named him), was an untreated diabetic cat. Upon further testing, Lou was also found to be deaf. Even with controlled feeding and regular insulin injections, regulating Lou’s blood sugar still wasn’t an easy feat. There were several scares when he crashed and required emergency treatment. His caregivers really weren’t sure that they would be able to keep him healthy and alive. At this point, the decision was made to place him in foster care so that his insulin and diet could be more closely monitored and controlled. And, like a true guardian angel, Nancy Colby swept into Cat Depot and it was love at first sight. Lou went home with his new foster mom and he began to thrive in Nancy’s loving care. He was fed nutritious diabetic food supplied by Cat Depot and Nancy kept his insulin injections strictly regulated. She event taught Lou sign language! At this point, Cat Depot decided to send Lou to one of their veterinarians to see if acupuncture would help him further. After a few treatments and diligent physical therapy sessions by Nancy, Mighty Lou’s legs began responding. With continued physical therapy, a healthy diet and a permanent home with his now-adoptive mom, Mighty Lou was able to discontinue his daily insulin treatments. Soon he was walking, then running and eventually even jumping! Mighty Lou has become the “spokescat” for Cat Depot’s “Friends Like Me” Program, which provides emergency medical treatment and ongoing care to Cat Depot cats and kittens who are sick, injured or have chronic illnesses, such as diabetes. He dons his superhero cape and travels around southwest Florida with his mom promoting the program and helping others. Though he himself is deaf, Mighty Lou speaks loudly to his cause and provides inspiration, happiness and laughter to all those who meet come in contact with him. He has defied the odds and now he is a model, a blog writer, an art teacher to deaf children, a radio personality, a superhero and an inspiration to all.